Facebook has just recently launched a new feature to their site to prevent phony profiles and pages. This verification feature will provide authentic pages and profiles with a small blue check mark next to their name, almost identical to Twitter’s verified account symbol. The verification symbol will appear on the profiles and pages themselves as well as in search results. 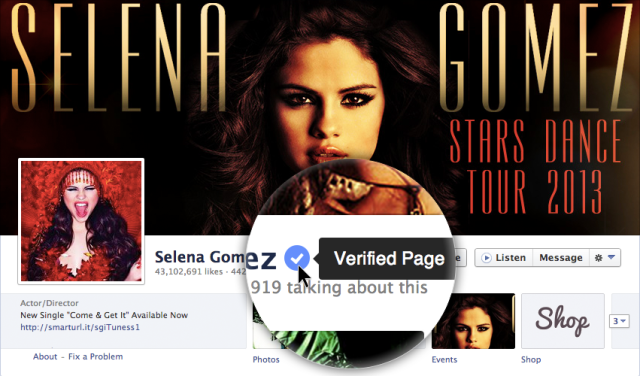 Facebook says that these new verified pages are being given to “just a small group of prominent public figures (celebrities, journalists, government officials, popular brands and businesses) with large audiences.” Facebook also stated that there is no way to request this badge of verification- the social media site will come to you with the addition to your page if they deem it necessary in proving your authenticity. This new addition will help Facebook identify whether or not reports and information they’re gathering from a given page is authentic and valid.